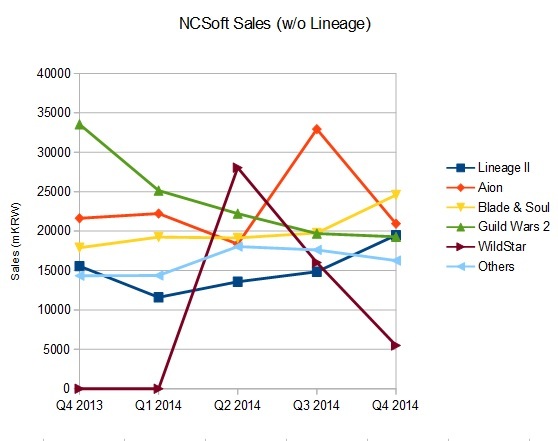 It was another solid quarter and year for NCSoft, as the company’s most recent financial statement reveals. Overall revenues were up 11% and net profit up 43% from 2013, thanks to “a stable performance from legacy games and an increase in loyalty sales.” Net income from Q4 was a mixed bag, down 18% from Q3, but up 36% year-over-year, when compared to 2013. The rest of NCSoft’s games are mostly steady from Q3 to Q4, with the exceptions of Aion, which spiked in Q3 and returned to its “normal” level in Q4, and WildStar, which nosedived from 28.0 billion KRW in its launch quarter of Q2 to 16.0 in Q3 to 5.5 in Q4. Major ouch. 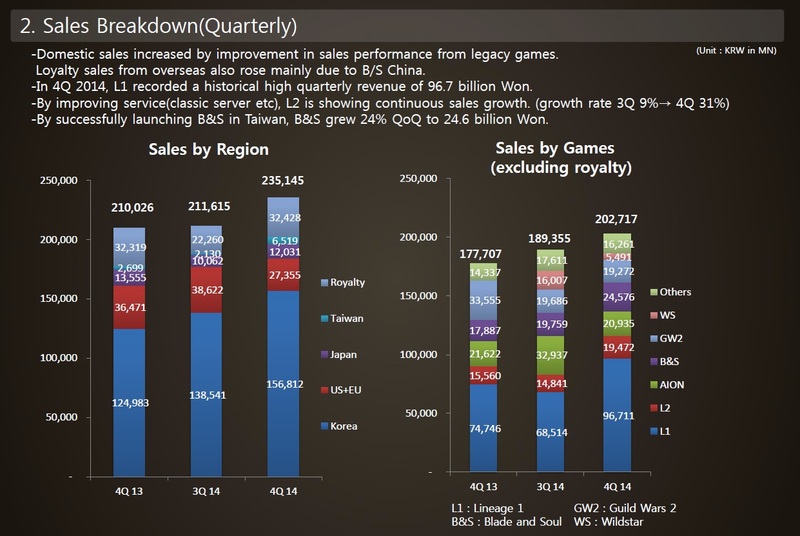 Something else I noticed combing through old financial statements to create those charts: NCSoft actually was in the red in Q2 2012, posting a loss of 7.8 billion KRW. They’ve had a positive net income in every quarter since. 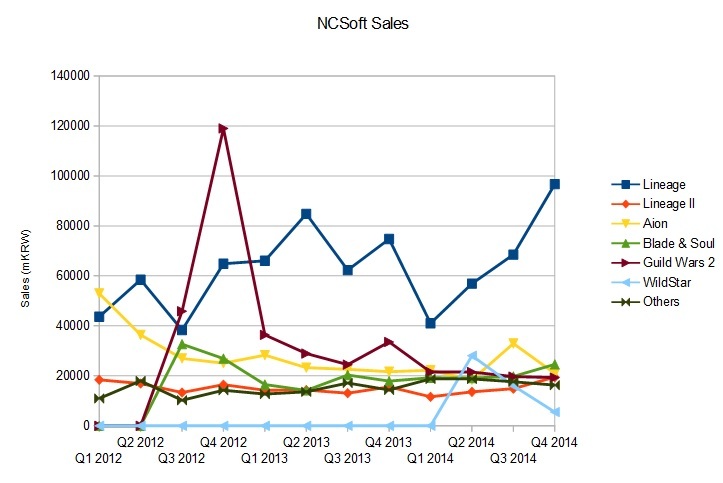 If you’re really interested in a big, messy chart that shows the same breakdown of sales by games going back to the start of 2012, you can view it here and you can download the various financial statements from the NCSoft Global corporate site. 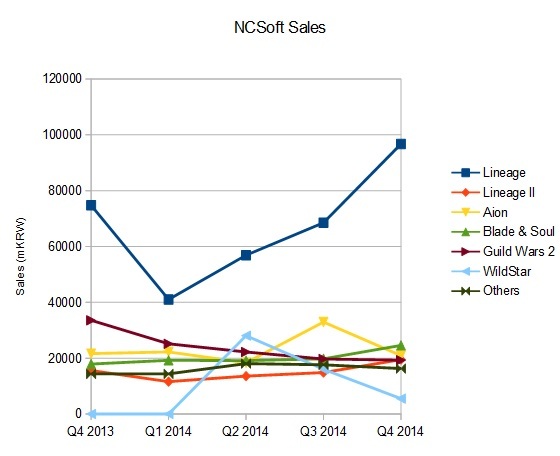 I really surprised Aion still doing great, compared to guild wars 2. Last time i check 15-20k player were online everday in EU. Servers are quiet empty besides cities and top level areas.